A range of our completed Projects in our two Specialist areas, Office Furniture with Workstations, Boardroom and Reception Fit outs and Hospitality which includes Cafes, Restaurant and Club Fit outs. These Projects have been proudly completed by the Seating Plus Team. Total Relax & Gaming Area Furniture Fit out. 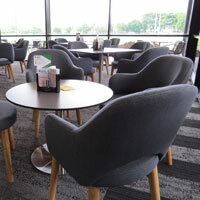 Seating Plus was selected to complete a Major Fit out of the AFL sporting Club in Cairns. Albury Tubs and Club stainless drinks tables in the Relax area. 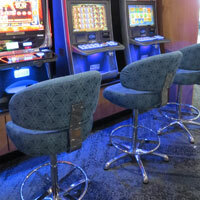 Kolne Gaming stools for the Poker machine zone. Warwick Fabrics were selected throughout the Fit out. Custom made Furniture for an Administrative Office at St Hildas School on the Gold Coast. Polar white Board colour was used to manufacture wall shelving units. Steel framed Work stations were curved to fit in with the room and Glass partition layout. Open Plan Library and Study Zone. 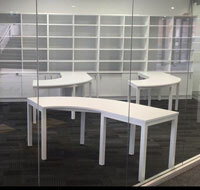 Zebra White Chairs with Compact shaped meeting tables to create a relaxed area for students to study. Era 3 seater Taupe Lounges and Chunkie custom made Beech Dry Bars 1800 x 900 x 1050mm high set with Zebra stools for a relaxed discussion break out area in the Libary. Compact laminate desk tops on Fully Welded Steel frames complimented with our Sparrow student chairs were used in 12 modern Classrooms featuring a open plan layout. 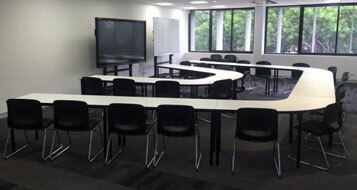 A combination of straight and curved desks were used to create an open flexible learning environment. Spacey Breakout soft seating was used in a range of Warwick selected Fabrics.